Help Aria Venom slay Draithor the Drill. Here is why I changed my mind and told the internet. Permission: This is the main reason I changed my mind. Recently, I was given official permission by several members of the ArenaNet Team to release this information. Multiple developers not only read my blog, but took the time to find out and inform me that it was fine to share this news. How it is that these amazing people are not only still paying attention to the blog, but have time to stop bug-squishing their three-day-old game is simply mind-boggling to me. I appreciate it and have told them so. One of the reasons I didn't just say before what event I created was that I am incredibly terrified to break the trust ArenaNet has bestowed upon me by letting me see their game so early. If I wasn't supposed to tell, I just wouldn't. With their permission, though, I feel comfortable telling the world about Draithor, Aria, the beach, and the Black Lion Trading Company. Pride: I am so proud of what we did that day. I know that for the staff of ArenaNet it was just another day at work, but this event is the single coolest thing I have ever helped create. I think everyone who read my last post knew I wanted to tell my family, friends, and total strangers about the epicness of Draithor's Demesnes. I was bursting and this is just beginning to let it out. Human Knowledge: I fundamentally believe that the internet should be a compilation of the vast sum of all human knowledge. If somebody knows it, they should write it down because it stays indefinitely. Whether I write another word or not, I know that as long as this blog lives so does all the knowledge I put on it. I want to put down as many of my stories as I can. The story of my event is one of the coolest ones I haven't told. So here it goes. On that day three years ago when nine of my heroes sat me down and said, "We want you to design an event. Do you have any ideas?" I was dumbstruck and shocked, but not paralyzed. My quick response, "about a million," was true, but miraculous. I was so terrified they wouldn't like what I was about to say. What I did say exactly I don't remember because everything happened very quickly, but it came down to an idea about organ donation and a necromancer. My favorite class to actually play in Guild Wars is ranger, but I have always been fascinated by necromancers. My fascination can be summarized by the quote that my necromancer, Aria Venom, says during the event. She says about her minions that they are, "Such useful vessels. Their accomplishments in death have far exceeded those in life," While I was there I don't think I ever said those exact words, but they are what I wanted the quest to say. It is essentially an organ donation story camouflaged so well as to be unrecognizable. You all know why I would want it to be that, as a heart transplant recipient/survivor. 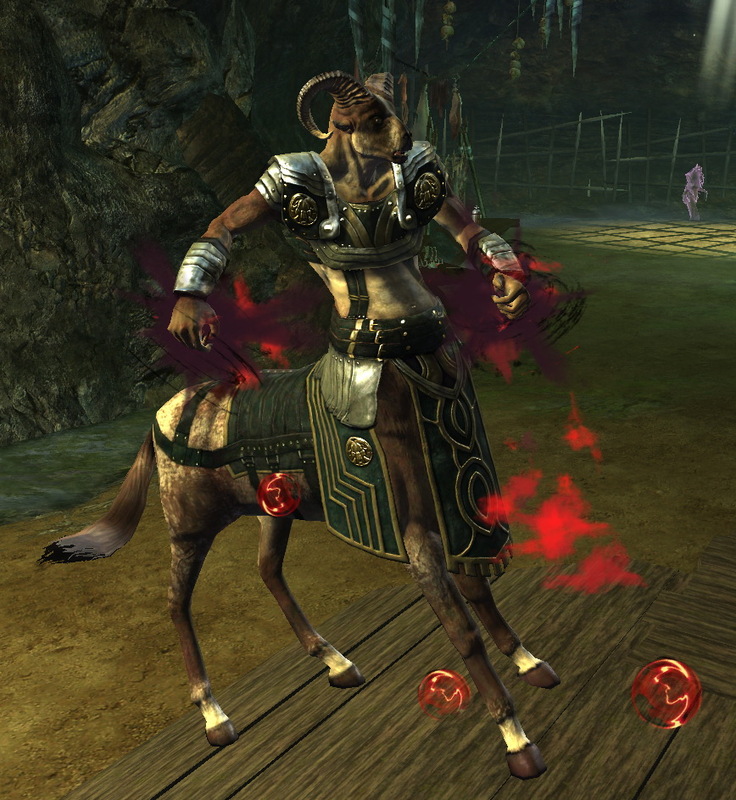 The idea is that a bad centaur, Draithor, is kidnapping people, drilling into them and trying to steal their magic. Then either you rescue the people or Draithor kills them all. If you fail the quest you have to collect all of the dead merchants bodies and give them to a necromancer to reanimate into useful minions. The minions then help you to destroy the evil centaur Draithor. Obviously it is a shrouded allegory for organ donation at best, but that is where the idea came from. The event I helped create, but it isn't mine. I remember wanting Draithor to be doing some evil poking or prodding thing, but someone else came up with the idea that he had all these drills in his lair. I remember that I wanted him to torture innocents, but someone else made them into travelling merchants. I remember that I wanted Draithor to live in a swamp, but someone else picked out Blackroot Cut. Aria Venom was my character name since forever, but she is certainly a bit different in appearance between Guild Wars 1 and 2. It was honestly a team effort. I had some ideas, but the designers of ArenaNet (Kristin, Colin, Jeff, Eric, Bobby, Ree, Mike, Ben, etc.) are the wizards that amplified and coolified all of my ideas. They are the ones that made Draithor seem evil and the madwoman sticking dead people back together merciful and heroic. One of my greatest joys when I loaded up Guild Wars 2 for the beta test on June 8 was to find Aria Venom alive and epic, but also to find that the main trading system in the game is controlled by a group called the Black Lion Trading Company. When I was there, selecting names for Draithor and Aria, it was explained to me that important people in the game have names, but that others are named simply villager or trader, peasant or noble, or some other generic term. The simple merchants that Draithor kidnaps, should be called merchant. The team thought my merchants deserved a bit more pizzazz if they were going to get kidnapped and murdered and reanimated for years on end and allowed me to name them more specifically. Due to the fact that the endlessly tortured humans travel from Blacktide Den to Lion's Arch (two amazing cities) I named them the Black Lion Trading Company. It makes sense due to their route and it sounds awesome. Now every time I log in to buy something I get to see that some traders are hard at work raising their (ironically white) banner. Lastly, I wanted to mention the beach. When I visited ArenaNet three year ago the game was much different. It was a bit sparser. It was a lot buggier, but it was so fantastic. All the elements we are now loving (the open world, the massive scale of artwork and story, the dynamic combat) were there, but the game crashed and failed and was broken in a hundred little ways. The developers kept apologizing for this, but I kept laughing. They were so sorry that their game, that was then three years from release, wasn't ready yet. I was so pleased to be allowed to play, three years early, that the glitches just made it feel special. At that point the game was evolving so fast nobody could have kept up. I remember that one of the healing elementalist skills kept killing Ree Soesbee (http://www.learsfool.com/). She questioned why and somebody in the back of the room responded, "We removed that skill last week." Ree's remark, which will live with me forever was, "I can never get good at this game because they keep changing the rules!" At that time everything was changing. I had never seen an environmental object so when someone showed me you could pick up sticks on the beach and whack drake and skale in the face with them I obviously said, "there should be more sticks on this beach!" I do not know where that beach was, but I was honored to play on it. It may or may not even exist anymore. There is no Emily's Beach, but Aria Venom will always stand there and reanimate the dead just as the doctors at Children's Hospital did for me. Thanks to Make-a-Wish for sending me to meet the magicians at ArenNet. Thanks so much to ArenaNet for giving me this experience and letting me share it with you. See you in game. Fantastic! I remember that quest well, all the little spectral monsters running about and then the final showdown with Draithor. I'd like to thank you for sharing all of this here and for coming up with the original event theme. I remember it from the time I just started playing GW2 and it struck me as particularly fitting for the game's setting. I was doing my precursor crafting for the Chosen shield, and I stumbled upon your quest. I think you did a great job in designing it! 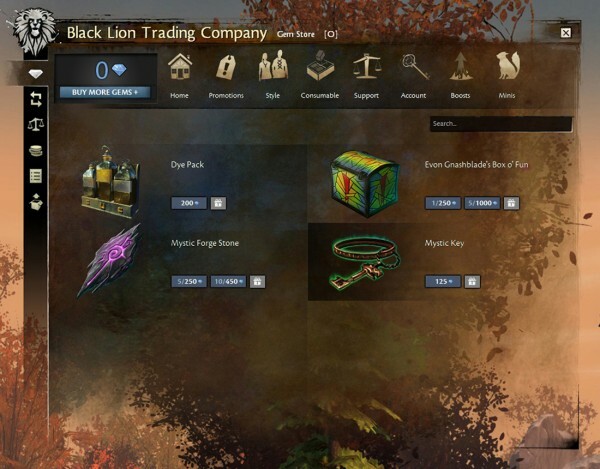 Also the name Blacklion trading company is bigger than ever, everyone knows that name, every single player that ever touched guildwars 2 will know that name!